Schistosomiasis (also known as bilharzia, bilharziosis or snail fever) is a parasitic disease caused by several species of fluke of the genus Schistosoma. Although it has a low mortality rate, schistosomiasis often is a chronic illness that can damage internal organs and, in children, impair growth and cognitive development. The urinary form of schistosomiasis is associated with increased risks for bladder cancer in adults. 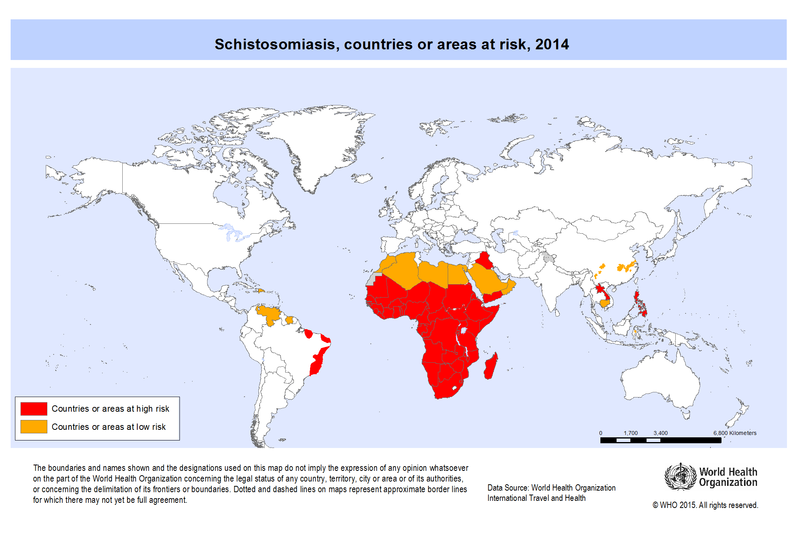 Schistosomiasis is the second most socioeconomically devastating parasitic disease after malaria. This disease is most commonly found in Asia, Africa, and South America, especially in areas where the water contains numerous freshwater snails, which may carry the parasite. The disease affects many people in developing countries, particularly children who may acquire the disease by swimming or playing in infected water.